Solar cells developed by Sharp and stacked with three layers of light absorbing layers have recently achieved the highest conversion efficiency in the world. By optimizing the composition ratio of the bottom layer in the three layers, the company has enabled the battery to efficiently absorb sunlight, thereby increasing conversion efficiency. 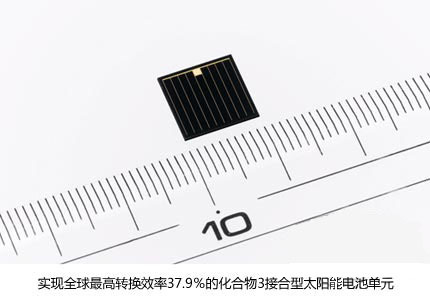 It was confirmed by the Japan Institute of Industrial Technology (AIST), one of the global solar cell public measurement institutes, that a conversion efficiency of 37.9% (cell area of â€‹â€‹approximately 1 square centimeter) can be achieved. This solar cell is named "Compound 3 Joint Type" and was developed as part of the research and development of "Innovative Photovoltaic Power Generation Technology" by Japan's independent administrative agency New Energy Industry Technology Development Organization (NEDO). Among the laboratory-level non-concentrating solar cells, 37.9% is the highest conversion efficiency in the world, and the conversion efficiency of the same type of solar cells reached 35.8% in 2009, 36.9% in 2011, and 37.7% in 2012. This time it refreshed again. Record. The compound solar cell is a solar cell having a light absorbing layer. The light absorbing layer is made of a compound made of two or more elements such as indium and gallium. Indium gallium arsenic is used as a bottom layer of the compound 3 bonded solar cell. Sharp optimized the composition ratio of indium, gallium and arsenic to achieve efficient absorption of light in accordance with the wavelength of sunlight. Sharp's Compound 3 junction solar cell uses the company's unique technology, using gallium arsenide as the middle layer and indium gallium phosphate as the upper layer, and it is manufactured by stacking three layers of upper and lower layers efficiently. Sharp began research and development of compound 3-junction solar cells in 2000 to achieve high efficiency, light weight, and improved durability of space solar cells. In the future, the company will make full use of the development results and continue to promote practical application.